Welcome to Married Life: A Birth Announcement! 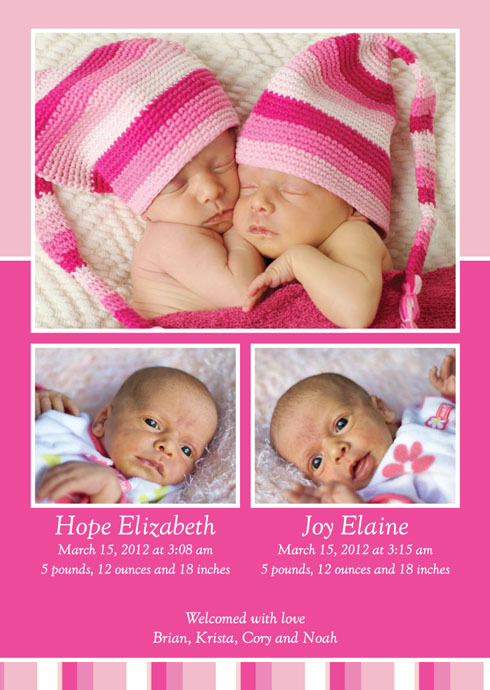 When Noah was born TinyPrints sponsored my birth announcements. I loved them and have continued to work with them since. So for really high quality announcements I had to go back. I loved this design for the girls, but the colors clashed just too much with the pink in their hats. As Noah would say, "What to do?" Well, they have fabulous designers and I just asked if they could tweak the background colors on the card to either match or complement the photos. Problem solved! TinyPrints was a partial sponsor of this post. The rest of the announcements I purchased with credits from previous work I've done with them. All opinions are my own, obviously! cute! sleeping baby shots are always a hit.